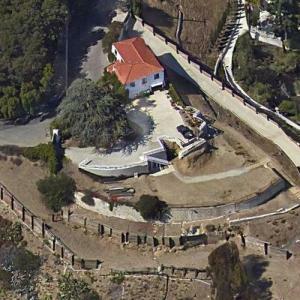 This is 'Falcon Lair' the house which was owned by Rudolph Valentino one of the most popular stars of the 1920s, and one of the most recognized stars from the silent movie era. The home has been gutted and virtually demolished in recent months by the present owner. No word whether he remodeled or has torn it down. 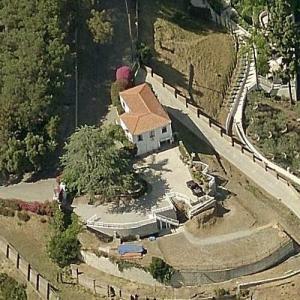 only interested in themselves and don't think about what they are doing.I've heard different stories,one being the house was torn down in 2003 but not sure.Beyond sad..
of Thousand Oaks where they have some large new homes..
Looks like a new house and the original guest house. It's so sad when we lose a part of history. Falcon Lair was wonderful! People just don't care. They bulldoze wonderful old historic homes and think nothing of it. Actually it wasn't a new house that birds eye view shows, it was in fact Falcon Lair before it was completely demolished in 2006. Of course, the house looked much different from when Rudolph Valentino and Doris Duke lived in it. Just learned that some idiot tore the place down...what a waste. That property should've been land-marked or something to protect it. Would've made a marvelous museum.